(P1) This news is from England. Some children are in the hospital. They are sick. (P2) Three window cleaners want to make the children feel better. They put on superhero costumes. They go on top of the hospital. They come down. They are on ropes. (P3) The children are sitting near a window. They can see the superheroes through the window. The children are very happy. The window cleaners are happy, too. They like to make the children feel better. 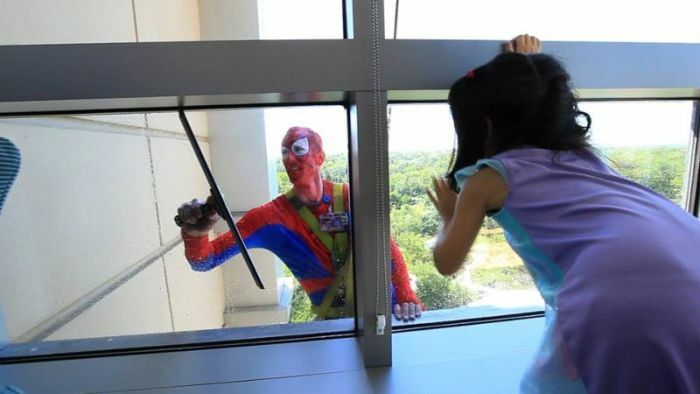 Would you like to be a superhero window cleaner? Why or why not? How did the window cleaners make the children happy? What else can make sick children feel better or happy? How many cleaners are there?